See also Webbing by TCWhite. Info: Created on 4th December 2016 . Last edited on Sun, 27th January. I had been working on a different font that I would release as a CC0 web font, but that one had quite a few more characters on it. Unfortunately, it doesn't seem to work with this new improved editor. So, I am going to try to tackle the project all over again. But of course. I want to have a more complete font before I release it. This is just to get ideas and feedback, for now. Currently, just basic latin characters, but I want to include all the normal characters one might need in a webfont, like bullets and arrowheads, currency symbols, important foreign characters so that it offers at least some unified character table support, and a few extras like icons of a shopping cart, credit card symbols, and important UI symbols. Of course, I also have to add the Copyright, Trademark, Registered Trademark, Service Mark and Tele symbols. At the same time, I don't want to include too much, I want the character set to be full featured, but lean overall so that it will load fast on websites. This, of course, just means there is lots more work to do, but thought I might give people that glimpse and get any feedback I can use. @Aeolien... Sure. I added a happy face in outline and solid, and an outline sad face. I don't know where the 'meh' face is hiding. Also added TM, SM, TEL, and a variety of arrow style bullets and such. @meek... Please see the 'sample' screen grab attached. I'm getting the same error message with multiple tries. @SymbioticDesign It installs on my system. I'll have a closer look in the next few days. OK, thanks. I did just try it again and I got the same message. Just tried to install it again. Windows 7 Home Premium 64 bit with Service Pack 1, powered by Intel Core i3 M350 @ 2.27GHz/2.27GHz and 4GB RAM (shared video memory). Windows is activated. All my other font archives seem to be installing just fine, it is only this one that I have had trouble with, so far. Ah. I thought I’d fixed this one. I did identify a problem. I'll take another look when I get a chance. Which is primarily why I haven't been here lately, I have 2 fonts that refuse to install, and if I can't make fonts that I can use, it's pointless to try. Well, I finally got it to install on my laptop, so I'm publishing it, again. Before it was under the Creative Commons license. 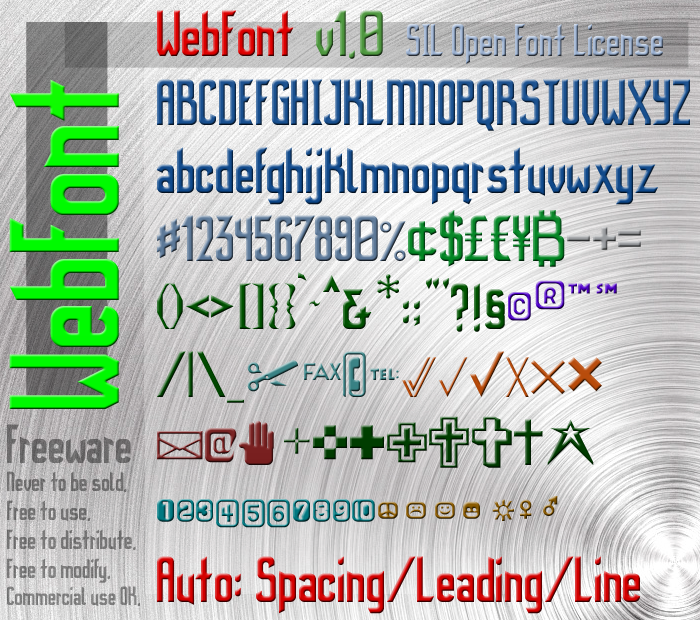 Now it's the SIL OFL, which for a web font, it probably should be. I don't really remember how done this is, or not, so if you see anything that needs attention, let me know. 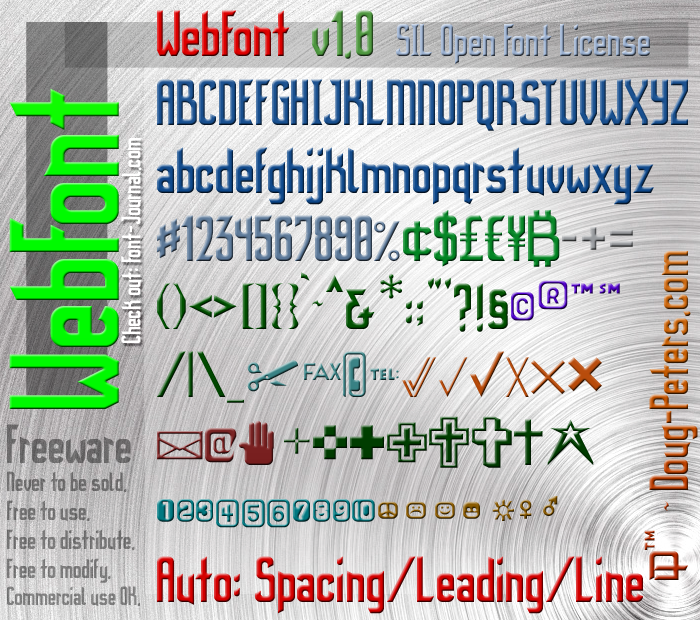 I wanted to make a web font a long time ago, but it wouldn't install on my laptop then (even though it apparently installed for everyone else). But, as I could not see it, I unpublished it. Well, now I have a new laptop, it installs, and so I hope it will for everyone else, too. • The font description (all your comment on top, as Html) is included in the TTFs (at least in this format); I did not check about the online version (Google Fonts under OFL license), but if an archived information does not exist, perhaps it can be linked somewhere (already or in the future). I don't think that Google has it, yet. I'd kind of be surprised if they added it to their fonts. I don't think that an SIL OFL license makes it automatically included, so I am guessing the "Contribute to Google Fonts" button wouldn't be ghosted, and as I had never been able to use it, it probably would need to meet with some sort of approval, first. Thanks for your comments. I have been looking at it and was actually thinking about making the: at, solidus, backslash, vertical, percent, number, plus, minus and equals signs needed to be thicker. And maybe the double quote sign is a little too corny? I didn't realize that. I always wanted it included as text in the distribution archive. Probably too heavy for a TTF. I'll have to learn more about this. ** In 2013 a FS member reminded me of BabelMap, to get the full font info (not very easily and not on any system)… As said, this feature should be available directly in the hosting software (e.g. via Parameters or Cache > Files > Media > Fonts > Info, even contextually via an extra option that would mimic the image clicling)… Perhaps you can edit your own font descrition that the FonstStructor added in Html, by using a (free) tool like FontForge (if you prefer a plaintext info, ASCII art, hidden Base64 image, 8K video^^…)? How do you find that info, @dpla? I made the & smaller but made some of that skinny stuff thicker. Hopefully, it works better together, now. I'll remake the graphic preview image with the changes. Strange thing, though... when I typed spaces in the preview section of Fonstruct, I saw returns. But not until I had started backspacing to correct what I had typed. • BabelMap > Menu > Fonts > Font Analysis Utility (F7) > Font Info > Font description. • (Forgot this reply): well, your previous " looked fine alone with its angular style. Now that you have added ‘ ’ “ ” the same way, the expected shape for the latter four would fit better with the new and correct (even) style of your straight quotation mark… although this is rather nitpicking (ditto with the absent but more superfluous ‚ ‛ „ ‟ ′ ″ ‴). I used BabelMap before, but have moved to a new laptop and forgot all about it. But, I never knew about the Font Info > Font Description feature. Yeah, the other issue would be for @meek. If I took the u and rotated it twice, would that make a better n? Hmmm... I'm going to try that. Whoops. I went into the editor, I changed the n, and then it told me that there was a newer version (by 47 seconds). So whoa... my only options were to continue or read something. I wanted to make sure I didn't corrupt the font, so I exited the web page altogether, thinking that I only needed to fix that one thing on the n, anyway. When reloading the Fonstructions page to enter the editor and edit the n though, it was already saved with the new style n.
I better take a break. Yeah, you're right. Very definitely. I don't know if the tabs should be sticking up on the m & n, but if I'm going to keep them like that I should probably add one to the r, eh? I think it helps with the angular goth cuts on the lowercase letters. Then knock-out all those ` ' " ; punctuations. But, I'm going to take a break, I have another logo project I'm working that needs more focus at the moment. Still working on it. I noticed the British pound sign was terrible. I have lots to do. I think I know why the "Contribute to Google Fonts" is ghosted, now. 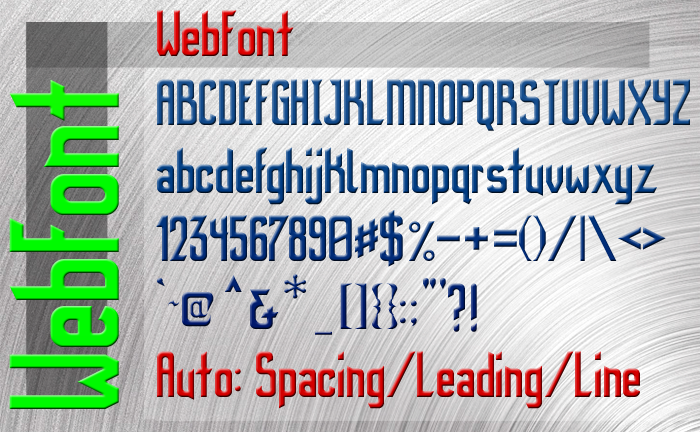 I am guessing there is already a font with such a generic name. So I will probably just keep working on it and try to get it right and create something good, but when I'ts ready I'll come up with a new name that isn't used and clone it, add a few characters and see what happens. Oh. Cool. I'll have to check out which ones they want. But first, I'll worry about fixing it. OK, cool. I only have a couple characters of the Latin Supplement left. Dang it. The block substitution is happening again. I do not see the "Google Fonts Basic" character set anywhere in Fontstructor. Perhaps because I started this font so long ago I don't get to see it? It's just getting too dang hard to find the missing glyphs I need in order to fill that basic character set. You'll find it when you change the licence to "Open Font Licence". That inserts the button "Contribute to Google Fonts" to the end of the line of buttons under the font preview. When you have set the licence this inserts automatically the Google Fonts Basic set of glyphs at the bottom of the 'language choices' in the basic (not unicode) setting. 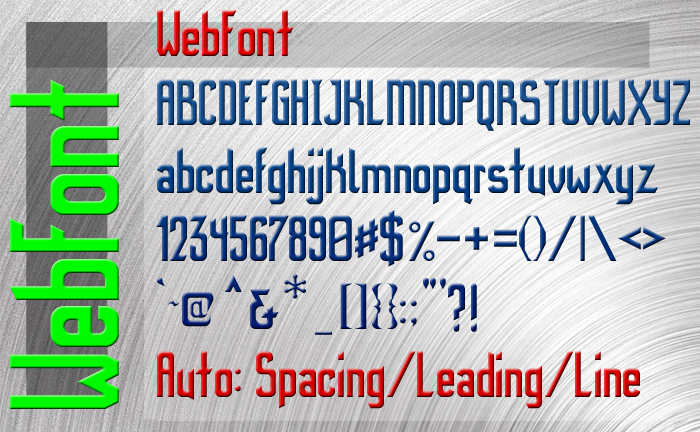 When you chose this you'll automatically see only the glyphs that Google Fonts requires. 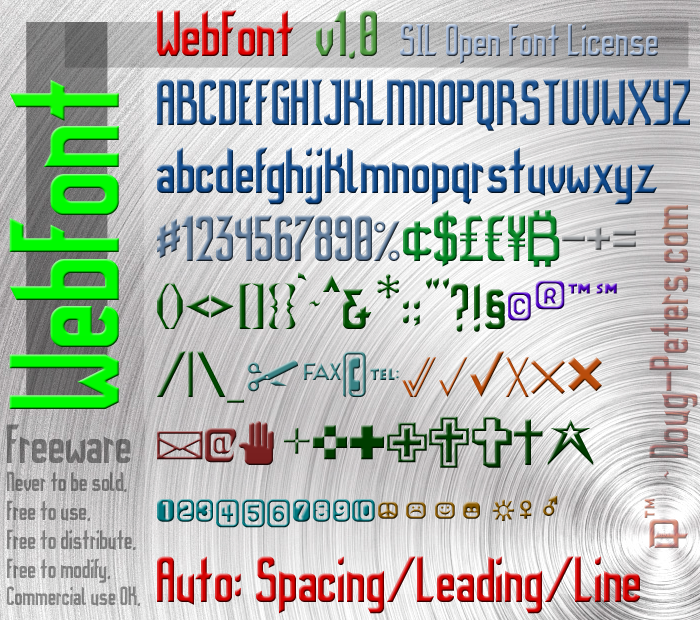 It's been "Open Font License". What, they can't be unicode? I need unicode. Darn. OK, I guess I can always turn unicode on, later. I guess its kind of ready to submit to Google Fonts. But what do you think? Should I make all the dots the same size (like in the diaeresis, make them the same size as the periods)? Did I get carried away with the goth cuts? Should I leave off the little caps on the smaller case r, p, m, n? Whattaya think? ;) & Thanks for your input in advance! I meant that you don't turn on unicode but stay in the usual basic glyph band to see Google Fonts Basic in the language panel. Google Fonts Basic option seems unavailable in unicode mode. But as for all our fonts the glyphs made are available on the unicode glyph band. Good catch, @Se7enty-Se7en. Yup, I missed the stroke on the small t. Thanks! I discovered a few minor issues to fix, I want to address them, and then I'll try to submit it. ;) Thanks for the help, everyone! OK, gonna submit it to Google Fonts for consideration. I hope it makes it in. That's no lie. I got in a struggle with an old netbook, and I am losing (so far), although I did win a battle with my new Dell, which allows me the extra time (since I am no longer trying to keep my old laptop working and updated). Plus, I am done with the logo work I did when I was doing this recently and need to find new work (or a new job). It would be wonderful if my career was creating fonts (getting paid for making fonts and typefaces), but sadly it's not. Spare time, even though I love doing this, is at a premium right now. I do hope to keep updating it, of course, but I also have other font projects I want to tackle, too, If it makes it into Google Fonts, I will be able to dedicate more time to this project, but we will have to see how that goes. I know there are fonts awaiting Google Fonts catalog approval for a very long time. I have been sidelined. I have an extra extraordinary tooth ache. I just want to die. I'm popping pain pills and nothing is happening. My jaw is swollen up on the left side, my head pounding. I will try to get back to this later. I want to addess the issues that were brought up on GitHub, but I can't even think at the moment. Better yet, Jesus, please take me? Wow that's rough, hope you feel better soon! I've updated the 0 & the x. Apparently, they have concerns about the k, the R and the s, but for me the B, R, K and k are all related, done in the exact same style, except the k has a shorter upper arm than the K, and the small k has goth cuts at the end of the upper ascenders (because it's lower case). Even the S complies to the same styling used in the B, R, K & k, but it's top loop is more centered because it's supposed to be a curvy S and shouldn't look like it is falling backward (but the others don't look like they are falling backward because they have strong backs). So, the s follows that very same styling as the S had. Therefore, I am figuring that it might not make it into Google Fonts. But, the 0 and the x did need to be fixed. I've updated the archive on my font repository website, too. I wouldn't download it right now. I'm trying to solve a problem. Hopefully I can make the right bricks, but still experimenting with that puzzle. Maybe I should make it private while I am working on it? This is getting better. :) Latin B: you have lowercase schwa in the wrong place—it's near the end of the block. 018F is the capital form. Very early comment: I don't know where the 'meh' face is hiding. I't's in extended pictographs, which you cannot access here, i.e., because it is outside the BMP (Basic Multilingual Plane). I also add quite a few more glyphs outside the BMP, such as the raised MC and MD, which are the Canadian forms for TM, SM, et ceterea. Concerning k: the issue may be due to the fact that the top leg is above the x-height? It throws off the balance with the remainder of the lc. Latin B again: check out my latest font, Gowa for more accurate designs. :) Or even Khnum or Hjet. Most people, having no idea about said characters, simply design them according to the Unicode images, which, for the most part, are wrong. They even state this in the Unicode guide book. Also, most people fail to research the languages that use these characters. All information about these extra Latin glyphs is on the SIL website. P.S. : Yes, you should make all the dots harmonize; the daeiresis should be the same as the regular dot on i—the same height, that is. This also applies to the dot beneath, et cetera. Wow, thanks for all the comments, TCWhite. Yes, I am trying to make bricks to solve an issue, I need a way to angle differently, and a slow curve is actually what I need, but that's the real thing I am always hitting my head on. I'm trying to fix some issues, but the block puzzle is unnerving me, so then I take a break and go to a different font. Hey there, Se7enty-Se7en, yup, I am trying to figure what the heck I can do about the 2, trying to build bricks with a different angle so I can make it work and still keep it angular. But I needed a break. Should I make a font private when I'm working on it even if someone can clone it and fix it themselves if they really want to? I'm not really worried about being embarrassed, I have the Font-Journal where I have my official font releases. Anything here can be "in development". @TCWhite... Namaste, I was looking all over the SIL website for some sort of reference to the multilingual glyphs and couldn't find it. I'll keep looking, but that is a design resource I really would like to see, so share the link if you have it. I am unsure what the raised MC & MD are, as I am unfamiliar with that symbol, but I'm going to check out your font to see what you were talking about. I also need to add an S with a Celia, for the Polish (at least, I think it's a Celia they add to the S). I couldn't figure out what you meant by the k leg being above the x-height. You mean the arm that reaches up diagonally? I'll look at it again. As far as getting the dots to harmonize, OK, that makes sense. I'll have to put my crazy period styling in everything else, then. I think the 'meh face' and other smilies were in the dingbats. These were done before I knew how to create blocks and delete the extras I didn't need in the composites by clicking on the composite with the shift key down, so I might revisit them. Sometimes I forget to save it with the universal characters enabled because I was trying to meet the Google Fonts character requirements guidelines. I did just update the font with more kerning, a new 2 and a new 7, but I think the 7 may have missed the mark. I'll experiment a little more with it. The idea behind this font as a condensed skinny bold font with gothic style cut ends that is intended to cram in as many letter glyphs as possible on a single line, and yet be perfectly legible, with selected extraneous dingbats and UI glyphs, but I might be able to add more now that I know how to use the custom composite block building better. And yet, I'm not going to take that too far since I've already got a sans and serif version of this font already sort of done, simply awaiting how I improve this one (and hence how I might improve them). Click on character set above the example text to see the characters. Polish: yes, it is a cedilla. In Latin A, the only characters that should have the cedilla are S and T. G, K, L, R, and N are named incorrectly, and should have commas, not cedillas. This goes for D as well, in Latin Extended Additional. Latin B, for example: Latin letter Oi is misnamed, and is actually Gh based off a cursive form. The x-height is the heighth of the lowercase, and currently your k exceeds, or rather, rises above it. It should be like x. If that helps? WOW, @TCWhite, what a great wealth of knowledge. This is a great library, and I am going to save all these links, and even put them online to assist others. AWESOME!!! I have already been educated a great deal glancing everything over. I feel like there is an online course in here. And this is the type of info I have been Googling for forever. Yum! Time to eat up all this delicious info! Fixed the stupid k no one liked (I actually like it better the other way, but I agree, it isn't appropriate with the rest of the somewhat boring characters). I am trying to find my kerning cheat sheet, I had it in here on one of the fonts. I did kern this once, just want to check it. I am also looking for the link to the archive submission on GitHub, but I can probably find it somewhere, I just want to address all the issues before resubmitting to Google, again. Adjusted the small k(s) so that the secondary arm is under x height. Adjusted all of the periods and dots to be the same, adjusted the commas, apostrophes and quotes to all be the same. This version should show more uniformity and compliance with SIL character design directives, especially as I corrected the cedillas and carons that are actually looking more like commas. Sorry that this update took a while. I do this in my spare time and I have way too many irons in the fire. I'm still willing to listen to any criticism, but I would like to get this one accepted (once it is what is expected) because I have a whole font family awaiting further development based on this model. It's really late (actually early morning, now), I will add some character sample graphic images, later. @TCWhite... Does Unicode 201A, the Single Low-9 Quotation Mark, sit at the same level as a comma (making it completely redundant), or up off the baseline a hair? I should probably try to look it up, but I figure you would know and it would be the same story for all the low hanging quote marks. Thanks for your critique! I forgot about all the other cranies that had characters here and there. Working on it, now. 1) Lookup what a Latin lowercase 6 is & lookup what a Cyrillic small letter soft sign is. 2) Lookup what a schwa is. 4) Lookup a swing dash. 5) Lookup a commercial minus. I think I addressed some of the stray dots and diaeresis. There were a few stray lowercase letters that didn't have goth cuts on the acsender. I can't add got cuts to the x, unfortunately. So, looks like I will have to go study, but I think I will see if it will resubmit or not. It may take a while for me to get to these last things on the list. The last updated reported a server 500 error, so I am trying again, though I have added a few more improvements. Since then, a fontstruct designer, @TCWhite (on fontsruct) spotted a few more periods, dots, commas, quotes I needed to address and did so. There were a few stray lowercase letters that didn't have goth cuts on the top acsender. I can't add got cuts to the x, unfortunately. That is the issue with the limited choice of bricks we have to build a font (I keep asking for more circles, especially, because the curve of a P, R, S is tighter than what's required for an O, D, C, etc.). I also adjusted some of the spacing for dingbat characters and the like. 1) Lookup what a Latin lowercase 6 is & lookup what a Cyrillic small letter soft sign is. Then fix the issue. 2) Lookup what a schwa is. Then fix the issue. 3) Find #0259 character and fix it. 4) Lookup what a swing dash is and fix it. 5) Lookup what a commercial minus is and fix it. There were a few blocks in there that were wrong, since I started updating it all. They were composite bricks that had been replaced with some other arbitrary brick. It was kind of strange. I fixed it, but I wonder how they got confused and thought they were supposed to be some other brick, especially when as composites, they were so darn special. The top two are in Latin B, with the exception of the lowercase schwa, which is in the IPA block. The swung dash and commercial minus are in extended punctuation, and the checkmark is part of dingbats—you already have it though. :) Your dingbat quotes should be the same as your exclamation marks, that is, bold. Yes, 201A does sit at the same level as the comma. It is a comma, really. 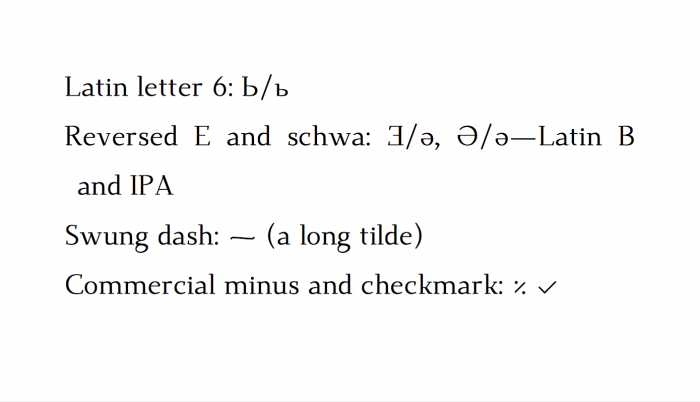 The difference has to do with the semantics of the character in programming—this is why there are multiple characters in Unicode that are identical visually, but behave differently according to how they are used in text/layout. There are still other dots in the extended punctuation block that should be the same size, such as the dotted cross, et cetera. This is all good info, thank you so much, @TCWhite. There are some dots that are a part of a character that are double as big. SIL wants different sized diaeretics, depending upon the 'base' of the character, which we can't do withoput some forethought, and I didn't have that option with this style, but when the dots are making up the characters, I decided to make them bigger. I get what you are saying about the bold quotes, now. I had always thought of them as featured quote signs. These are the bigger fancy quotes that is pulled out of a blog, or article that are intentionally styled differently from the rest of the font in order to make that snippet of a paragraph or sentance stand out from the rest of the article (usually in much larger italics). But I will make the design I am using (that same idea) much bolder. I will probably get to those things today, I hope. I am struggling today, though, so I can't promise anything. Your commercial minus sign actually looks like a percentage sign with dots instead of o's. Thanks for the graphic image to clear that stuff up. I have a lot to do today, I know I won't get to everything, but I hope I can get started today. I'll wait to do another image of the character sampling, until things are fixed. The 500 error should hopefully now be gone. Could you try again? Thanks! I am having difficulty making the fancy quotes any larger than I did. If I use quarter circles, then I don't have a curve big enough to act as the tail. Although now they are using a full sphere block, once again I would need bigger curves to make them appropriate for the font, so I am just leaving it where it is until there are more curve blocks (if ever), because I do want to use this style of the fancy (usually bold) quotes. This is all I can really do today, I will have to address any other issues, later, but I will try to resubmit it to Google now, so that we can see if that works. Added goth cuts to the horizontal bars of the Z (I don't know how it escaped them until now). Made a longer schwa dash. Added goth cuts to the capital Esh. It looks like I fixed the commercial minus, previously. It turns out I take issue that the dots should be the same size when the dots themselves define a character, I think they should be larger and fill out the entire space. This seems to be inline with the fact that the SIL likes to see diaereses that take their size from the size of the letter base, and I think the letter base of a dot based character should be larger than a diaereses. This is up for debate, as far as I am concerned, so I am willing to listen to any arguments to the contrary, but leaving the dot based characters as they are for now. I guess I need to make the capital schwa look like a large reversed small letter e, I'll do that now. UPDATED the submission to Google Fonts. It's not just SIL: The dotted characters are actually punctuation marks that were either placed after a sentence or paragraph, or before one to mark it. They are, technically speaking, reference marks. This is why I make them all the same size. P.S. : your Thorns are still slightly off on their design. They should be like so: Þ (capital height) and þ (a combined b/p). Reduced the size of the dotted reference marks in the punctuation bank. Going to look for the Thorns, but I have to get back to work, very soon. Lots less time to play, these days. Just so you know, everytime I see the Þ (capital thorn), even now as I write this, I see it raised off the base line and the loop of the lobe is uplifted to the right. PÞpÞbÞB -in every one of these I don't see the capital thorn height reaching the capital height of the other capitals, and it is off the baseline. Heck, I think the fix I did for that one was wrong, going back in. OK, so I extended the ascender and decender (tail) of the Þ, but centered it back up. I never see the decender reaching the baseline. Not ever in any characters I have seen. Not once. AND, I have never seen the capital thorn's ascender reach the capital character height line, nor have I ever seen the capital thorn reach the tallest lowercase ascender height line. Not once. But I made the ascender a little taller and the descender a little lower. IÞl Crap. It's the overshoots, which... AHRGH. OK, optical illusion understood. I still don't like the þ (lowercase thorn) because the ascender is so much taller than the tail is long, and I always see the lobe & bowl centered, but I guess for this style that's the way it is supposed to be? I even extended the tail more than it should be (for this style). Reduced the size of the dots in the dotted reference characters (in general punctuation). Reworked the capital Thorn and the small thorn to be more visually accurate. OK, I made some adjustments to both Þ & þ (capital Thorn & small thorn). I always saw the capital Thorn as having a bold stem/ascender. Now I realize this is another optical illusion, so I reduced its weight, but I left it a tiny bit heavier than other characters because I always liked that about that character and so I'm not abandoning that illusion so easily. Otherwise, the rest of the adjustments I made I un-did. As for the small thorn, the lobe is now x-height, but I thought that looked really strange, and so I looked at the way it was, as you say, a p & b in one and how it has, still to me, an uplifted lobe, as opposed to a 'normal' p or b lobe. This again, may be an optical illusion based on the axis of the bowl, but I am trying to communicate the difference between the form of the capital & the smaller case, and I have no real way to spin the bowl access a few degrees, and wanted that part, the uplifted lobe, to be communicated visually, so I changed-out the connected block for the left top rounded corner square. @meek hasn't said anything about the Google Fonts submitter working, but I'll try again. I haven't stopped working on this, I know I have a lot left to do, but between now and into the New Year, I am going to be way too busy on business and personal projects to do anything of any consequence. I will add a graphic or two later from my "Domainer" account on GitHub. I'm going to be real busy until into the new year, but I haven't stopped working on this and will finish out the Latin Extended B character set when I can get back to it in 2019. @TCWhite... I have a little trouble 'copying' characters from a known font. I will check out those thorns in your fonts, but by basing my characters on just whatever I see as examples that are not specific allows me some plausible deniability with respect to Copyrights. That is, the ability to say I didn't copy any specific Copyrighted font where the work and style is under copy protection, endangering me, as an artist by opening myself up to Copyright Infringement (which is honestly hard to do in today's world). Which is why I prefer selected texts with samples that are generic and used as examples. Eventually I will get there, check them all out, but I am absolutely careful about not opening myself up to liability in Copyright issues. I am probably paranoid about it, but since I can't afford a lawyer, I need to be. I have gotten no feedback from @meek on this or my last issue with a previous font that I needed restored to an earlier version. So, I don't know what's up. I also tweaked the upper 'stem' of the 3 and made it less angled and cut the aperture of the lower bit a tiny bit shorter with a shorter shoulder (though I am not sure if I am applying these terms right in the case of a 3). BTW, @meek, when you pop-up a new tab to submit the font to Google Fonts, I keep using that tab, as I don't realize you opened a new tab in my browser. It's possible that this is why the double fontstructor window bug is causing issues with block replacement. The thing is, I have Fonstruct pinned. I know where it is in my tabs and can always get to it. You introduce a new tab and I think I am working in the same old one. I go to another tab, and come back to a pinned tab. I wonder what happened to my stuff. I have 16 pinned tabs. My web browser is not full screen (nor do I want it to be). I have 15 other tabs open too, and I only see 2 and a sliver of the the 3rd. What I am saying is that the unpinned tab gets hidden, so opening a new tab in someone's web browser is not best practices UI and results in a poor UX. Now, maybe you are on vacation, maybe you are working on the issue, or a number of issues, I don't know. 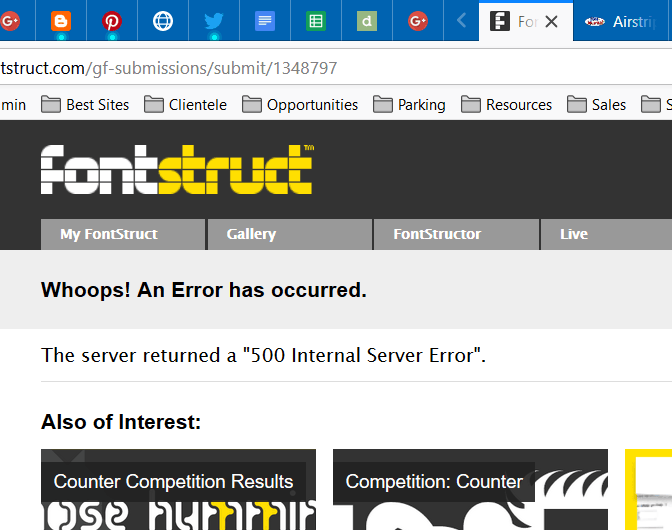 Perhaps it's not my business, but I have been trying to get your attention on a past issue for a month and not hearing anything about this issue (the 500 Server Error submitting to Google Fonts).